Did anyone else sing that in elementary school. What a funny song. Oh and then there was “Dreidel, dreidel, dreidel, I made it out of clay and when it’s dried and ready, oh dreidel we will play. Oh…” Does that song ever end? How the heck did my mom put up with my siblings and I constantly singing these endless annoying songs?! 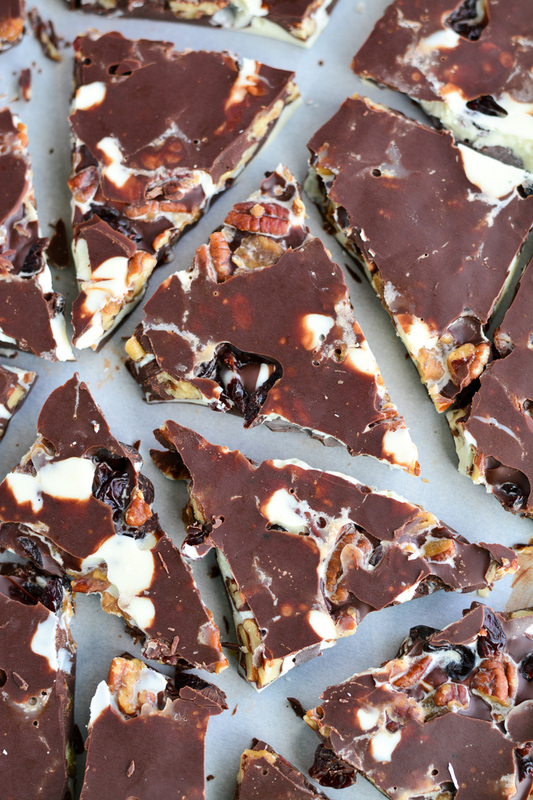 So um, this bark is A-mazing. Really, my husband tried a piece and said “Wow! That stuff is good! 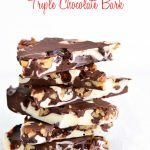 Like really good!” There’s nothing more satisfying than making something my hubby really enjoys. I made this on Saturday and I think between my husband and I we have already eaten a pound of it. And so the holiday weight gain begins! No wonder so many make the New Years Resolution to eat healthy, workout, and lose weight… but that’s not for another month so let’s enjoy all the yummy holiday treats! So make this for yourself, family, and friends. It would be a great treat to handout for a holiday gift. Yummmmmm! Preheat oven to 400 degrees F and line a baking sheet with parchment paper or foil. Mix spices together in a small dish and set aside. Melt butter and brown sugar together in a pan over medium-low heat until bubbly. Add chopped pecans and cook for 4 minutes to caramelize. Mix in the spices and then spread the nuts onto the lined baking sheet. Bake for 6 minutes and then cool completely. Break clumps apart when cooled. Line another baking sheet (17 x 12 inch) with parchment paper. 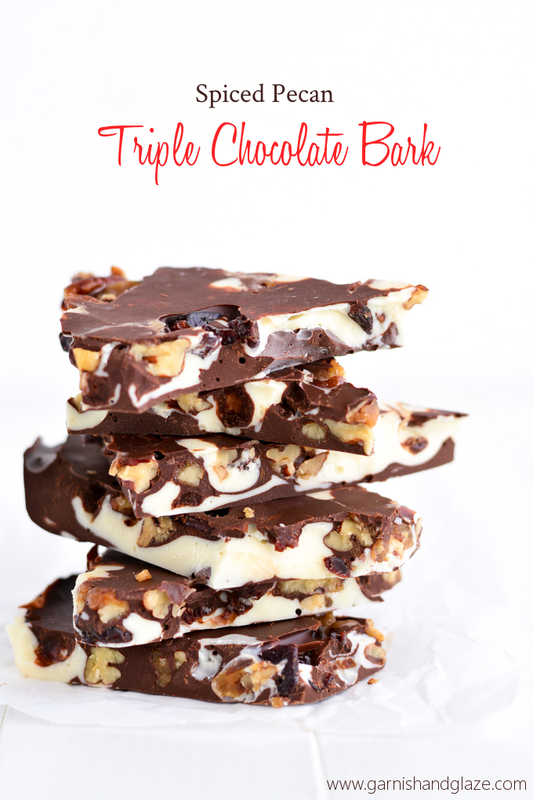 Drizzle each chocolate like ribbon over the parchment baking sheet. (I like to drizzle the semi-sweet, white chocolate, and then dark chocolate.) Sprinkle cherries and pecans on top. Cover chocolate with parchment paper and press flat and to the edges of the pan. Place chocolate in the fridge for at least two hours. 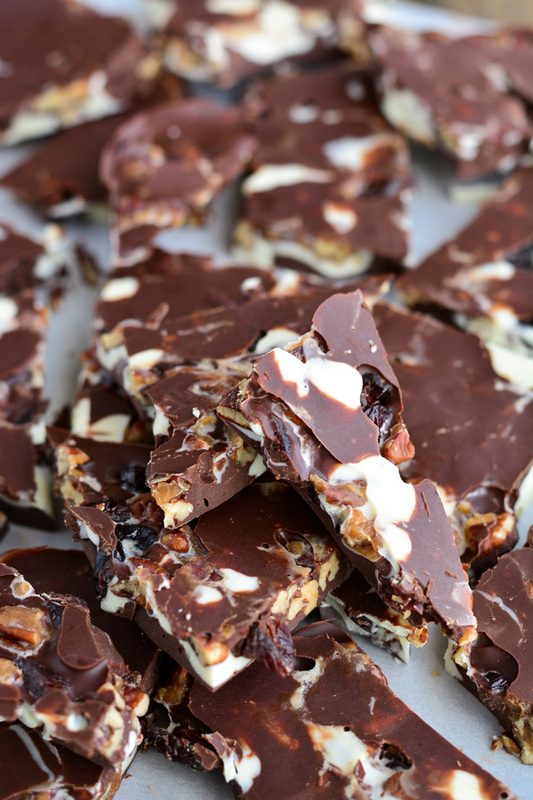 Remove top parchment paper and then break chocolate into 50-60 pieces. Store in a plastic bag or Tupperware in the fridge. 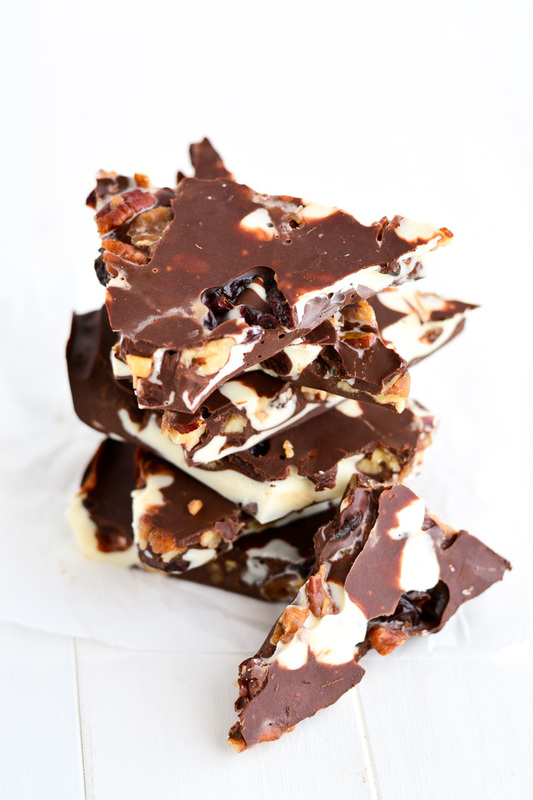 This chocolate bark looks SO awesome! Perfect for this time of year.. I have a feeling it would make a great Christmas gift too wrapped up all festive. 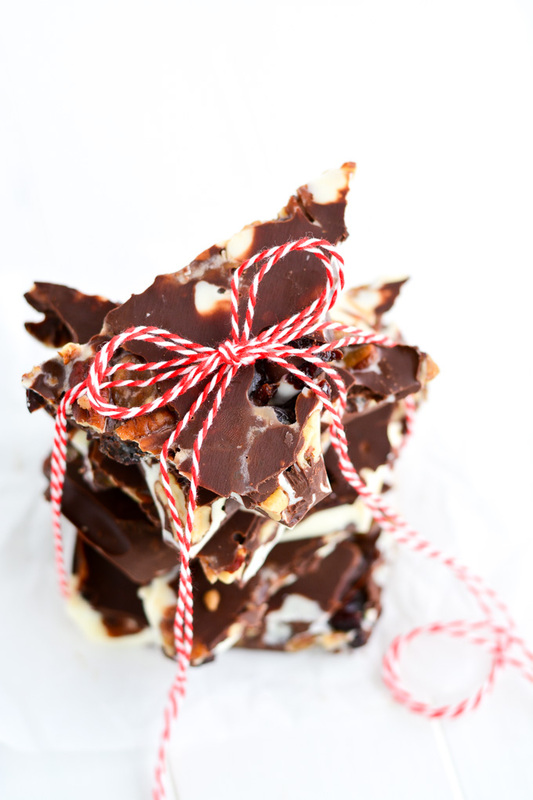 This bark is a perfect holiday gift! Just wrap it in cellophane and some ribbon and call it good. Thanks Thalia! 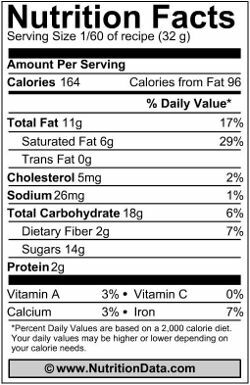 wow this looks wonderfully delicious this is one of my favorite types of deserts thanks cant wait to try out your recipe. Thank you Rebecca! You’ll find that it is very addicting. Haha! It’s so addicting! Glad you’re enjoying it and sharing it with your friends Ginny.